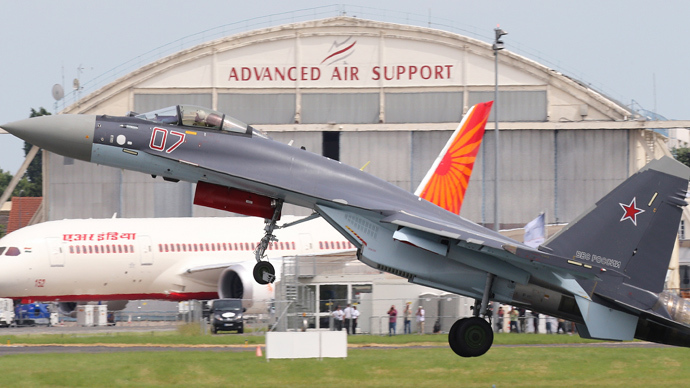 Russia’s Sukhoi 4++ generation fighter is ready to rock the 50th Paris Air Show at Le Bourget with the premiere of its cutting-edge Su-35 fighter. 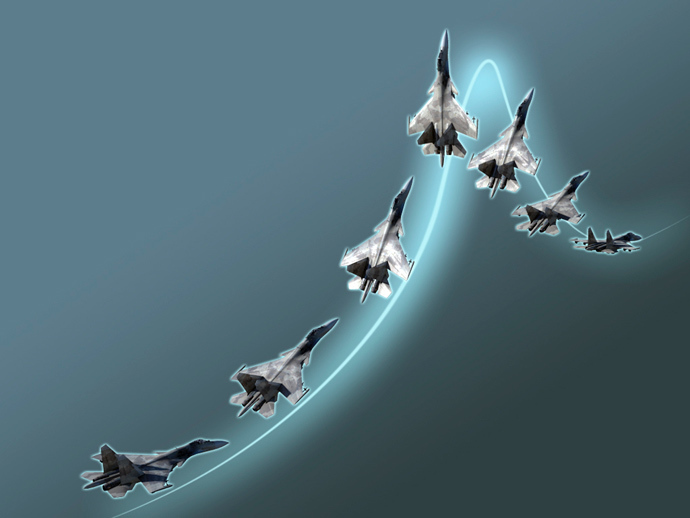 Super-maneuverable even for a Sukhoi, the Su-35 has been dubbed the “UFO” for its outstanding maneuverability. Many aircraft traditionally make their world premieres at the biennial airshow at Le Bourget in France. Among them this year will be the Sukhoi Su-35 (NATO classification: Flanker E), Russia’s newest, super-maneuverable, multirole fighter jet. The Su-35 is generating so much interest that the airshow organizers have assigned it a spot right in the middle of the main avenue of the exhibition. This 4++ generation aircraft uses fifth-generation technology, and its advanced avionics, new engines, and remarkable weapons array mounted on 12 external hardpoints outperform any existing fourth-generation fighter. It has top speed of 2,400 km/h, a 3,600 kilometer range, an 18 kilometer ceiling, and an advanced radar system to detect large targets from as far as 400 kilometers. Probably the only major feature that the Su-35 lacks — and which prevents it from being labeled fifth-generation — is stealth capability. Nonetheless, it can detect stealth aircraft such as the US’s F-35 at a distance of over 90 kilometers. The aircraft’s thrust/weight ratio is unique at a kilo of thrust per kilo of aircraft weight, thanks to a pair of brand new 117C jet engines. This enables Su-35 to perform all current stunts, including Russian specialties such as Pugachev’s Cobra, the Frolov Chakra, the Dead Leaf, and the unprecedented Pancake, which is an horizontal 360-degree made turn without losing speed. The Pancake is performed only by the Su-35. With these characteristics, the Su-35 surpasses practically all modern fighter jets such as France’s Rafale, Sweden’s Gripen, the Eurofighter 2000, and the modernized US F-15, F-16, and F-18. It is on a par with the fifth-generation US F-35 and F-22A, neither of which are currently on the market. • Armament: one internal GSh-301 30mm cannon with 150 rounds; up to 8,000 kg of ordnance carried on up to twelve external hardpoints, including air-to-air missiles, air-to-surface guided missiles, guided bombs, or external fuel tanks. The Russian Air Force currently has 10 Su-35s, to be increased to 48 by the end of 2015. Two other Russian aircraft are to debut at Le Bourget: The Yakovlev Yak-130 (NATO classification: Mitten), a subsonic two-seat advanced lead-in fighter trainer / light attack jet, and the Ka-52 Alligator, a coaxial rotor scout helicopter gunship. The airshow takes place at the Le Bourget exhibition center from 17-23 June, and opens to the public on June 21. The airshow brings together over 3,000 aircraft makers from 44 countries; 1,040 are French, 350 US, 124 German, and 115 Italian. Forty six are Russian, including Sukhoi. Lasy year’s Le Bourget show saw a record $100 billion of contracts signed, and the organizers expect at least $125 billion to be signed this year. Some 70 percent of the more than 140 aircraft being exhibited are civil, with the rest being military. Around 40 aircraft will give flight demonstrations.